The No. 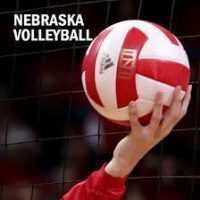 7 Nebraska volleyball team rallied from an 0-2 hole to topple No. 14 Creighton, 3-2 (22-25, 19-25, 25-18, 25-22, 15-10), Thursday night in front of a crowd of 14,022 at CHI Health Center Omaha. It was an NCAA record for a women’s volleyball regular-season match. The Huskers were sharp in set three, leading throughout to earn a 25-18 win and extend the match. NU used an early run to gain separation in set four and held off the Jays for a 25-22 win. In set five, Foecke accounted for nine of NU’s 15 points, and she ended the match with her new career high in kills, 25, the most by a Husker since Kelsey Robinson in 2013. Nebraska had a .258 to .207 edge in hitting and out-aced the Jays, 10-6. Megan Miller had three aces to go with Foecke’s four. Maloney also had a pair of aces. Set 1: Davis posted three early kills, but Creighton got six kills on its first seven swings to go ahead 7-6. Callie Schwarzenbach got a kill and then set Foecke for a kill on her first swing of the night to make it 8-7 Huskers. A stuff by Schwarzenbach and Sweet, followed by another kill by Davis and back-to-back Creighton errors gave the Huskers a 13-9 lead. Creighton strung together a three-point spurt to pull within 14-13, and the Bluejays took a 17-16 lead after an ace by Kloth and kill by Jaela Zimmerman. Foecke sided out for the Huskers, but the Jays scored the next two to go up 19-17. Sweet terminated to pull NU within one, but a service error restored Creighton’s two-point advantage. Sweet got another kill, and Davis added her fifth to even the score at 20-20. The Jays held tough, though, scoring the next two points to regain a 22-20 lead. After a timeout, Sweet connected again from the right side, but the Bluejays gained set point at 24-22 and clinched the set on the next rally as Kloth connected for the eighth time on 10 swings. Set 3: Miller sparked the Huskers with a pair of ace serves to help NU to a 4-0 lead. Creighton took a timeout as the Huskers went ahead 6-1 for their biggest lead of the match to that point. Creighton got within three at 10-7, but back-to-back blocks by the Huskers put NU back up by five, 12-7. The teams traded sideouts for four rallies before a CU hitting error and solo block by Foecke made it 16-9 Huskers. Another block by the Big Red, this one by Foecke and Schwarzenbach, increased the lead to 17-9. Davis’ 12th kill of the night capped a long rally, and Foecke blasted out of the back row before Sweet tipped a kill to the floor to make it 21-13. After the Jays scored twice, Sweet and Foecke produced kills for a 23-15 lead, and a Miller ace – her third of the set – ended it at 25-18. The Huskers limited Creighton to .023 hitting in set three. Set 4: A pair of kills by Foecke and one by Sweet, combined with back-to-back CU hitting errors lifted Nebraska to an 8-3 lead. The Bluejays chipped away to within 11-9, but the Huskers answered with the next two points and went up 16-10 after a Lauren Stivrins ace. The Bluejays sliced the deficit to three at 17-14, forcing a Husker timeout. After the timeout, Creighton served long and then hit into the net, and Foecke served the Huskers’ seventh ace to restore a six-point lead, 20-14. But Creighton came right back with another 3-0 run of its own before Davis ended the run with a kill to make it 21-17. The lead shrunk to two, 21-19, before Davis sided out once again to keep NU ahead by three. With a 22-20 lead, a huge dig by Davis, followed by the freshman’s 16th kill of the night, made it 23-20. Foecke followed on the next rally with her 19th kill for set point at 24-20. The Jays fought off two set points, but Foecke sealed the 25-22 win with her 20th kill, setting up the first-ever fifth set between the schools. Set 5: Foecke tooled a block to begin the set, and her next kill made it 3-1 Big Red. Davis connected twice more to boost the Huskers to a 5-3 advantage. Hames saved a ball from going into the scorer’s table, and Foecke and Stivrins finished that rally with a block before Foecke’s career-high 23rd kill gave NU an 8-5 lead as the teams switched sides. After the break, Foecke and Schwarzenbach stuffed a Creighton attack to make it 9-5. The Jays fought back to within one, 10-9, after a block, but Foecke’s 25th kill made it 11-9. The All-American then served back-to-back aces for a 13-9 Husker advantage. Creighton went into the net to give NU four match points at 14-10, but they only needed one as Maloney served an ace to clinch the match.